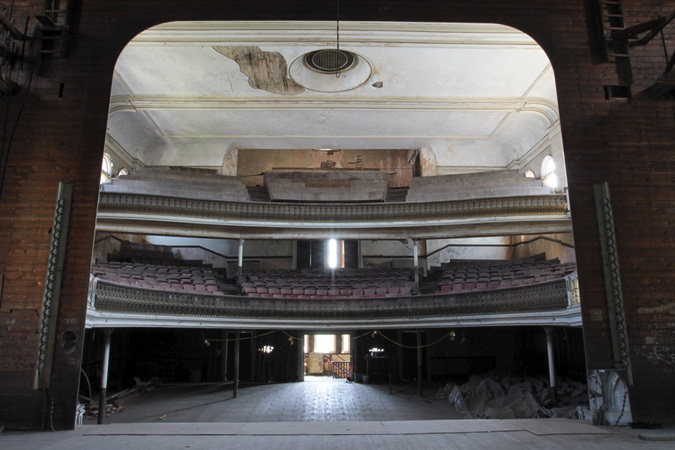 Here are more shots from the time we spent wandering through the Sterling Opera House. There were rows of wooden seats on the second level with some having star shaped perforation decorating the seats. Our guide told us that the lucky audience members that got the "star" seats would win a prize during performances. The top level had bench seating for the "cheap seats" but still had a great view of the stage. Oh, and on the stage was a pile of painted backdrops that dated back to the 1930s that hadn't been unrolled since they were used in a production. I would love to be there when those are finally unfurled! all of it is gorgeous! Wow, what a great collection of photos. I wish we could see the 1930 back drops too. Wonderful pictures :) your pieces look great against the background. Great photos! The aesthetic of the opera house compliments your vintage pieces well! I am secretly coveting that chunky grandpa sweater. These photos are stunning, almost eery. Such a creative idea for a collection.